The APA Foundation provides community assistance through programs that help economically challenged and disaster-devastated communities affected by hazards such as floods, hurricanes, and wildfires. Community Planning Assistance Teams (CPATs) composed of APA members offer their time and expertise to help people in places where additional resources are needed. After Hurricane Katrina, the Foundation supported four CPATs in impacted areas, deploying one team to New Orleans. The devastation of Hurricane Katrina to the City of New Orleans remains unparalleled. Images of the flooding, the evacuation — the destruction of lives, homes, and community spaces — remain etched on the consciousness of Louisiana residents. Much like the aftermath of Hurricane Maria, basic services remained disrupted for weeks and months in late 2005 and early 2006. Community members were indefinitely relocated to places like Atlanta and Houston, as local leaders and elected officials turned to the tasks of response and recovery. A professor at the University of New Orleans Department of Planning and Urban Studies and lifelong resident of New Orleans, Jane S. Brooks, FAICP, was uniquely positioned to not only support local recovery efforts, but to also lead the APA Foundation's CPAT team. "The City Planning Commission team had been slashed. ... It went from 24-person staff to 8 people after Katrina. As a result, the City needed the support, but just didn't have the capacity to help the CPAT folks." New Orleans was balancing a range of competing demands — and competing recovery processes that were not leveraging the expertise of the local planning community. 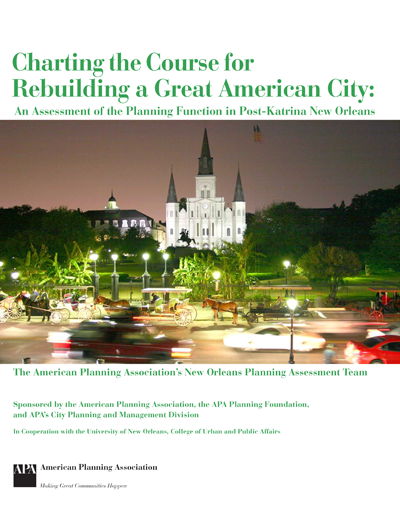 While many universities and associations sent teams to New Orleans, these outsiders often missed what was unique about New Orleans, not taking the time to engage residents or to learn about the challenges (and opportunities) so familiar to practicing planners. The Mayor and City Council also launched well-meaning processes, but these initial attempts at recovery plans missed the mark. The plans did not have sufficient community engagement either and did not meet state requirements to release the necessary funding. "We're very grateful that the APA Foundation stepped in and elevated the role of local planners in the recovery process." With Brooks's guidance, and her network of colleagues and friends, the CPAT team was able to balance the outside perspective — a perspective that carried the legitimacy of a national organization — with the local knowledge of APA members living in New Orleans. Brooks introduced the CPAT team to nonprofit organizations and local leaders. She provided broader context for the city's interrupted master plan update and shared the planning norms and values of her home city. "We needed the strong voice of APA to say planning is very important — and needed a logical sequence of planning elements and aspects, if you are really going to recover and build back even better." The CPAT team's recommendation offered clear next steps to build on the existing master plan updates, including the need to complete the housing element and update the 1970s zoning ordinance. "It didn't happen quickly," Brooks said. "But, the CPAT team's recommendations reaffirmed that these things needed to be worked on. And, they did eventually get worked on — and did provide the backbone for a lot of the recovery efforts." The third planning process — The Unified New Orleans Plan — brought together residents from across the city and those dispersed throughout the country, engaging evacuated citizens in discussions of how to rebuild their city. Funded by the Rockefeller Foundation, The Unified New Orleans Plan achieved a strong level of community engagement and leveraged local planning expertise. An amplified version of the CPAT process, the plan provided a roadmap for recovery and became a best practice for resilience efforts around the globe. "Our work with New Orleans was a springboard to more than a half-billion dollars we have invested in the resilience building efforts around the world," wrote Judith Rodin, former Rockefeller Foundation president in What We've Learned from New Orleans. "It inspired us to create a network to help Asian cities better prepare for climate impacts. It gave us the expertise to help New York rethink its own resilience after Superstorm Sandy. And it was the model for 100 Resilient Cities, now a $164 million commitment to help 100 cities globally build social, economic, and physical resilience." In response to the 2017 hurricanes and disasters, APA members and the APA Foundation partnered to raise funds for disaster recovery community assistance, continuing the Foundation's tradition of supporting disaster-devasted places. Planners in communities affected by these disasters are invited to apply for grants to assist their community recovery efforts. If your community is moving from response to recovery, visit the Hazards Planning Center for best practice guides and recommendations to mitigate disaster and build back better. Read more about the personal impact of disaster from APA Foundation Board President Mary Kay Peck, FAICP, who shares her experiences in A Planner's Close Encounter with Hurricane Irma. Top image: Crowds in Jackson Square in New Orleans. Photo copyright 2016 Kelly Wilson (CC BY-NC 4.0), from the American Planning Association's Image Library.